First let me apologize for the delay and for the length of this installment. I thought I would put Italy all on one post, but I see now that it became a longer trip, and a longer post, than I had imagined. You can look forward to shorter, more frequent posts in the future. I arrived in Civitavecchia, Italy, at 10:00PM by ferry from Barcelona. By 11:00 I was sleeping in an empty, off-season food concession area, part of boat club and rental place, fifteen feet from the remarkably clean and clear waves of the Mediterranean Sea. Next day, I was not impressed. The roads were in no better repair than New York State’s roads; glass and litter was worse. Narrow streets and highways, no shoulders for miles, traffic full of aggressive drivers in all kinds of rigs, from small to tiny. At least the drivers were competent, and 99% were courteous. I got along all right, having grown up on a bike in similar conditions, but it was no picnic. 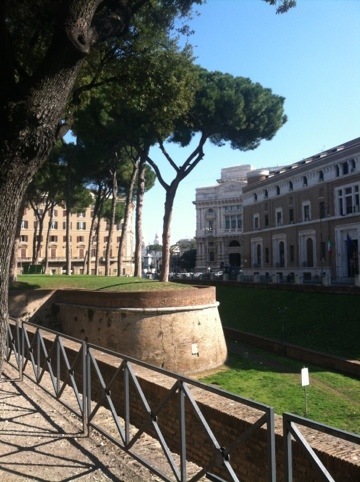 Navigation was easy, however; in this area, all roads lead to Rome. But that road has few gaps in the fence. 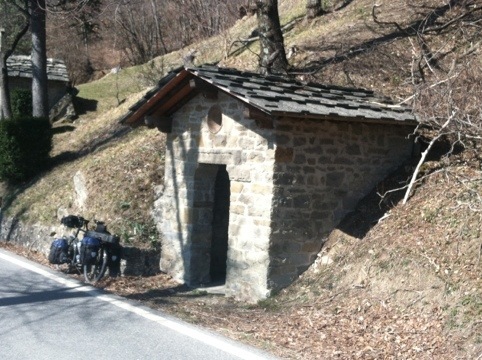 Side roads are residential cul-de-sacs; back roads are scarce and don’t connect easily in the hilly terrain. Many roads were simply private. I took main routes because the back way was more than twice as long. The main route brought me to Rome in one long day. I slept on a park bench across from a court house. Up early, I toured Rome like a tourist, saw as many monuments to antiquity as I could, and some side streets and neighborhoods in between. I could have, perhaps I should have, spent more time, learned more history. But I was feeling antsy, eager to push onward, and staying meant spending money. I’ve been getting a new phone number and data package in each new country. Tired of the time spent at cell phone stores and the expense, I skipped it in Italy. So, no detailed maps and routes, no e-mail or blog posts until I find wi-fi, which is scarce here. My google map covers the whole country, and it takes half a day of pedaling to make the little dot move. As night came in Rome, I went north, and lucked out in a private, magnolia-surrounded parking lot behind a for-sale warehouse at the edge of the city. Protected from the wind, I slept on a thick mattress of leaves. Northward to Viterbo was into a headwind on a nightmarish narrow, busy highway. Here, sixty miles from Rome, the countryside began to appear in patches, towns no longer overlapping. The wind picked up, blowing like crazy. I found an off-season campground with cabins. Nobody around, so I set up in one and cooked my dinner, very happy to be inside as the wind shook the little room. Later I saw lights at the main house, went over and surprised the hell out of them. I paid €10 and received a warm welcome, a pillow, and an electric heater. After another day of headwinds and a farm road campsite protected from the wind by a small hill, I met Chris and Peter, an unlikely pair. Chris is 22, from Florida, and on his first bike trip ever, a week-long ride from Rome to Siena and back. Peter is a tall Dutch cyclist, 46, on his fourth month of touring Italy. Chris is the most remarkable young man. Equipped for hotel and restaurant travel, we talked him into camping with us at an abandoned farm house, using an old brick barn for a windbreak. Suddenly I’m cooking for three after a long stretch of solitary travel. I happened to have a bottle of wine and some good fixings. Chris was home-schooled and raised vegan, is a pianist, botanist, and origami artist, among other things. Good communicator. Peter escaped from the office some time ago and travels a lot now, camping and staying at churches. 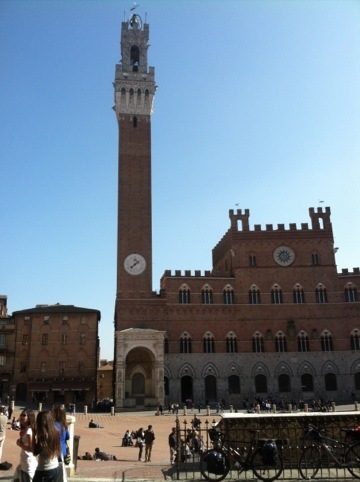 We made it to Siena next day at noon. Pizza and wine on the plaza, lots of happy people, a perfectly charming city, one of Europe’s oldest. We split a room in a 500 year old hotel, marble and brass and wi-fi. At noon next day Peter and I said goodbye to Chris and enjoyed Siena a bit more before heading north toward Florence. We travelled, camped and ate together for three more days, sharing cooking and bottles of wine. I enjoy traveling solo, but I enjoyed traveling with Peter, too. Good conversation and similar tastes in campsites were two reasons. I learned a lot from him. For instance, he had been staying in churches and monasteries along the Via Francigena, a Medieval pilgrim route from Canterbury to Rome. The tradition continues today: if you fit the description “pilgrim” (that is, if you are on a moral quest and self-powered), a room and a meal are provided for free. Mass is at 7:00. Other similar routes stretch to Jerusalem. Florence rocked my world. Like a beautiful home filled with the finest artwork but lived in, comfortable, welcoming. I tried to busk but with no permit I was politely stopped by friendly policemen and policewomen in the dandiest uniforms ever: navy blue tailored-looking outfits with white pith helmets and white leather belts, sashes, holsters and spats, and cool white leather belt-bags to hold their white leather gloves. Such a pleasure to be busted by you, officer! Leather is a local specialty. In one area dense with shops I discovered that many have back rooms where custom clothing, bags, shoes and luggage can be crafted in a day or two, cheaply. I was tempted by one salesman’s offer to copy my bicycle windbreaker in light leather for €200. He showed me the back room with men old and young busily sewing, hundreds of hides hanging, and big maple cutting tables, all in a very old building on a very, very old street. 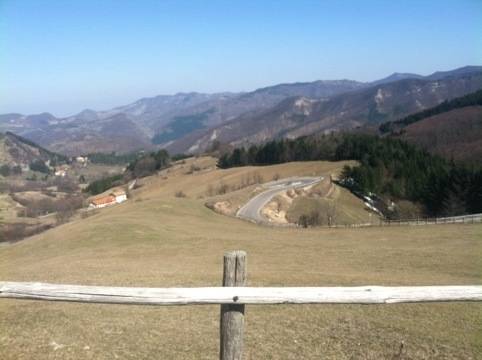 From Florence to Bologna we crossed the Apennine Mountains, three days of fine weather and glorious bicycling. I have little to compare it to; higher than the Adirondaks, not as high as the Rockies, populated with towns and villages, sheep and cows, memorable switchback climbs and descents. We camped at an old ruin, and at the top of a pass (990 meters, about 3250 feet) between patches of snow. Up and down, several mountain passes, incredible vistas, cold spring water, hilltop monasteries and WWII history, then a crazy hours-long downhill into Bologna, where the terrain abruptly turned dead flat. Bologna was bigger, busier, funkier than Florence. Peter and I searched for wi-fi, finally finding some in a library. Good pizza and local beer, a university feel (there are several), huge plazas, towers, parks and architecture. Here Peter headed north toward Austria and I went east toward Venice. Leaving a big Italian city like Bologna with the sun low in the sky is chancy. How far to a countryside campsite? How long until dark? Minutes before sunset I took a side road and two kilometers later spied an old farm with chickens and geese and Guinea hens, and in the dooryard a very old woman standing, smoking. Camp? Sleep? Tent? She smiled and waved her cigarette; anywhere. By the time she was finished closing the window shutters and the henhouse door, I was set up and cooking dinner: millet with carrots and onions and cheese; chocolate and clementines for dessert. In the morning I found the farmer feeding and watering chickens and gathering eggs. He looked like Burl Ives, round and goateed with a twinkle in his eye. I pitched in, farm chores our common language. He spied my mandolin and said, “Violina!” with a thumb to his chest. Soon we were in his kitchen (remodeled in 1890, by the looks), playing classical and ragtime tunes with huge laughter. “Vino?” he said. Why not? It was fine: home-made from home-grown grapes. Between tunes and toasts to music, with great difficulty and effort and sign language and writing down words and dates, I got Claudio’s story. Born in that very farmhouse in 1942, he pursued the violin against his father’s wishes but with his mother’s quiet approval. He studied violin in Bologna (his diploma, in Latin, taken down from the wall for me to inspect); achieved a position in the symphony orchestra in Florence, had students and a dance band gig (he played a recording of the band’s lively music). He returned to the farm to help out when his father got sick; when his father died, he stayed. The old woman I saw was his mother. His wife was dead, his sons gone. Beautiful photos of them were on display, at arm’s reach. When an egg customer came, I took the opportunity to pack my mandolin away. I was presented with two liters of wine and a genuine bear hug. Good man, Claudio. I spent one night at a small private airfield, about the size of the one in Middlebury, Vermont, a quiet and pleasant spot. No permission, but friendly waves from the aviators and mechanics as they left at dusk. Next night was the lousiest campsite ever: among thorny brambles by a noisy railroad track, lights shining from back yards, dogs barking, geese honking. I was in the country now, but everything was plowed and planted to the edge of the roadside and irrigation canal, or fenced in and gated off. A damp breeze covered everything with dew, inside the tent as well as out. I woke early and packed up wet. Flat, straight, busy roads brought me closer to Venice. I set up at lunchtime to dry my tent and sleeping bag, then got caught in a shower. I packed up wetter than before. Pedaling onward in a light rain and the spray from tractor-trailers, I felt tired and got to thinking: I haven’t taken a day off since Girondella, Spain, some fifteen days ago. Lightning in the distance encouraged me to consider a room for a night or two. The first two I found were on the highway and too expensive: €40 or €45 per night. Then I caught a glimpse of a sign, “Ostello”. Ten minutes down a small paved lane I found a neglected old hostel where I could stay two nights for €34. Thunder in the distance made the decision even easier. I was the only regular guest: most of the rooms were being used to house refugees from Libya. Twenty-five men, most from sub-Saharan Africa and a few from Bangladesh and Singapore, had gone to Libya to work, lived lives there, and had escaped the violence there last year in fishing boats, with harrowing tales to tell, friends killed and bullets dodged. None had passports. Italy gave them a document to travel locally, food and shelter, and €75 a month. There are 40,000 more just like them in Italy today. These are not illiterate fruit pickers and ditch diggers, either. Joshua, from Ghana, was a dental technician; Kitia from Mali had a landscaping business with employees; Lucky from Nigeria was a professional soccer player. They’ve been here nearly a year, and they all desperately want to work somewhere, anywhere, at anything. But unemployment is high in Italy, they have no working papers, and the local men hate them. Except for the proprietor of this hostel, an overworked 35-or-so Italian who prepares two meals a day for the men and seems to love them. He insisted I eat with them, on the house (that is, on Italy!) The guys all wanted to know about America, all wanted to go there. A few spoke English. Some I never met, because they rarely leave their rooms, depressed. They have two cell phones among them and no computer, and no idea what will come next, or when. So I settled in to my big room with four bunks, spread my stuff out to dry, washed the woolens, and wrote some of this post from notes I keep in my calendar. Next day I brought my bike into the sunny yard to clean it, and soon had several helpers and many questions about America. How do I get to America? How much is a plane ticket? Is there work? Obama made them joyful, and they quoted Martin Luther King. They all knew that if they could get to America and find work, everything would be OK. A local college kid came by every day for an hour of Italian language lessons, but they all wanted English. They kept themselves and their clothes neat and clean, even dapper, but the grounds were a mess with junk bicycles, discarded stuff and trash. When the proprietor arrived with groceries he had more helpers than bags. Two guys held my bike upright for an hour while I cleaned it. Before i leftI gave Lucky my extra smart phone, the one I got in London from the family I stayed with after my accident. With the hostel wi-fi, they can access the Internet, have-mail, and start working on getting a passport. I wished I could do more, and I will if any of them ever make it to America. Goodbyes were not easy. 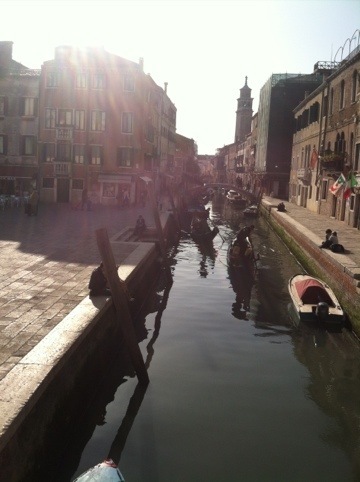 A day’s ride brought me to Venice. We’ve all seen pictures, but I was unprepared. The beauty, the architecture and statues and decoration, the limestone and granite bridges, the canals and boats: I was overwhelmed. Once you cross the bridge, you park (at some expense). Arched bridges with steps made even my bicycle impractical, and I didn’t see a single bike during my stay. The random street layout you see on the map is for walking only, and there are many more tiny passages than the map shows, some tunnel-like under buildings, some dead ending in a beautiful courtyard, some only four feet wide. Wandering aimlessly, I found plaza after plaza (called “campos” here and nowhere else) ringed with outdoor seating for restaurants, bars and cafes. All had impressive statuary and fountains, some had trees and stone benches. The canals and Grand Canal were alive with fancy gondolas for the tourists, taxis and buses, work boats, delivery boats, personal craft from flatboat to ChrisCraft, even garbage “trucks” and UPS boats. Rowed gondolas, just like the tourist ones but plain and simple, served as ferries across the Grand Canal, saving a long walk to one of the bridges for half a Euro. I used them a few times. Ten or fifteen Venetians and a couple of tourists would stand (no seats), with only calf-high gunwales between passengers and the water, while two men rowed us across. I found the cheapest room in town, and fell madly in love with Alina, the young Polish woman who was in charge there. To my surprise, she seemed delighted with me. We had a super evening in a jazz club, good live music and wine. The pianist (also the owner of the club) knew Alina and joined us at our table after his set, and we met some more very cool people as well, musicians and artists. It was a long and very happy evening. In the morning I knew I had to leave, but I lingered, wandering the streets, sitting in the sun on a campo fountain steps, delighted to be there. I finally got back to my bike and crossed that bridge, wondering how and when I would return. So that was Italy, basically. Another two days of flat riding, now on nicer roads (with a forgettable roadside campsite), and then I spied the mountains of Slovenia. A little while later,in the border city of Gorizia (Goriča) I looked up to see the signs were no longer in Italian. Arrivederci Italia. Billy !!! I’m happy to know all your great experiences and now that I’m still working you make me travel from my home, thanks man!!!! Take care and enjoy a lot!!! Hey Billy boy, nice stories you write. I love the way you write. Anyway. I am now in Germany. Austria was beautiful, stayed at a warmshowers address. I am almost home. Cycling a lot nowadays like 160km crossing the border from Austria into Germany and today I cycled 120km from Worms to Koblenz. Don’t worry about the photos I took while we were traveling together. I will post them when I am home as internet is very difficult in Germany. Everywhere signal but protected. Second you need to pay for everything. Even at Mc Donalds there is no free WiFI. Toilets costs here 50 cents. Anyway in Germany at the Ikea and Mc Donalds you can tap your own drinks if you buy a cup first. Well buying a cup I forget and tapping my own cup for free and tap and tap again till i am full. Then I fill up my bidons before I leave to the next Mc Donalds. Well write you soon again.